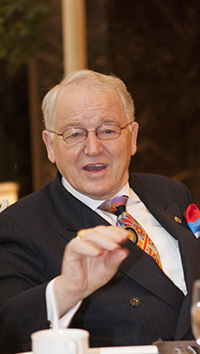 Mr. Bernhard Brender, the general manager of the Grand Hilton Seoul in Hongjae-dong, has spent way over 30 years out of over 50 years of his career in hotel business, bringing his native German culture into the heart of Seoul. The seasoned hotelier looks and behaves more like a cultural ambassador rather than veteran general manager. He has been hosting the most famous German beer festival "Oktoberfest" at his hotel's convention center annually since 2007. "It’s all about the originality,” Brender told a local Korean daily in his recent interview. "It is as authentic as the one held in Munich"
"People expect to have the best draft beer at the Oktoberfest," he said. "The music will be the traditional German music and the sausages and other foods are the same"
Thanks to the efforts of the German hotelier, the "Oktoberfest at the Grand Hilton Seoul" has now become the most well-known German beer festival in the nation. Mr. Brender boasts a wine selection of his friends both local Korean and international folks in the nation with his highly social character. He also take part in a myriad of local and global events both home and abroad as a socialite as well as to promote his hotel. As a European (German) who loves Asia, he is married to a Indonesian lady, has been working and living in South Korea for the last 30 decades or so. The Seoul Times met him before and listened to him to find out the secret for his success as a hotelier. The following is the story about him. The Grand Hilton Seoul stands atop as one of the premiere hotels in Seoul. Yet, earning this status didn't come easy as Mr. Brender, its general manager, explained in a recent interview with The Seoul Times. He does not approve of businesspeople who place profit above all else. His business philosophy is called "people before profit." He explained that greater money is earned when a hotel accomplishes customer satisfaction because these clients will return often. His business philosophy played a significant role in the recent achievements of the Grand Hilton Seoul. “Always greet customers with smile,” he stresses this basic principle as a secret of his success. As “king of hotel managers” in Seoul, he tries very hard, almost always no matter how busy he is, to entertain people he meet. He enjoys talking and hobnobbing with people, friends, or customers. He never loses his kindness even dealing with his subordinates at work. His success and prominence as the “top hotelier” did not come easy. He had to climb the ladder of success in the hotel industry through hard work and insatiable quest for something news. Friends say he never cease to asking questions about anything. He returned home to build and run a brush factory. Nevertheless, his family did not obtain a luxury lifestyle and described experiences of abject poverty. As a young man, he never dreamed of becoming the general manager of a luxury hotel. His motivations to work in this industry were to express his love for people and travel the world. He studied or worked in the United States, the Philippines, Switzerland, China, Kenya, Thailand, Indonesia, and England. He hasn't lived in Germany for about 40 years. He came to South Korea in 1991 and remained here ever since. Mr. Brender is filled with a passion for his job as well as his Roman Catholic faith. He participates in numerous volunteer activities with his motto being, "The answer is yes. What is the question?" He explains how he must keep earning money to give much of it away to the poor. He succeeded in both business and family life. When asked what he wishes to tell the readers of The Seoul Times, he finished with a powerful quote. "Never give up! Today is the answer, do it today not tomorrow."